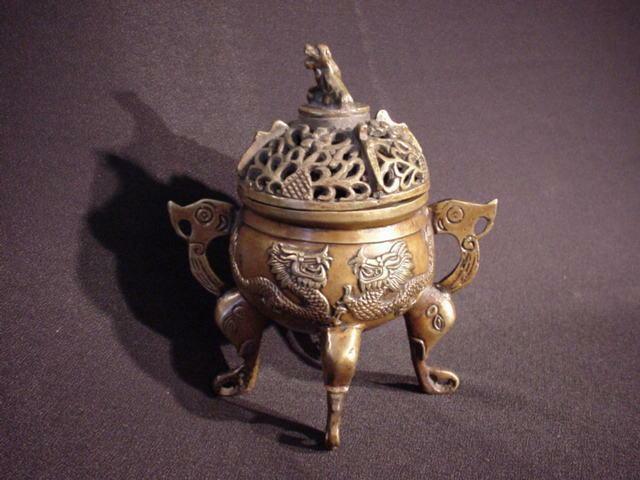 Description: Elaborate Japanese bronze koro or incense burner, c. 1900. 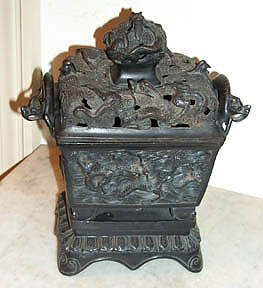 Highly detailed rendering of two dynamic foo-dogs on the side panels and one sitting regally on top. Exquisite braided handles. Cleverly stamped on the underside. 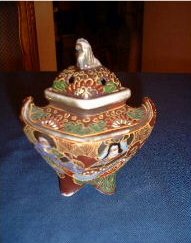 Dimensions: 10” high, 4.5” wide, 4” deep. 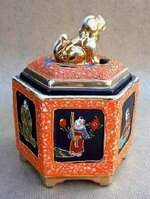 Description: Old hexagonal incense burner in satsuma, with different hand painted human characters on each face, enamelled and gilded with fine gold. 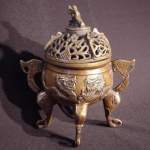 The lid is surmounted by a dog gilded with fine gold. Stamp in lower part. 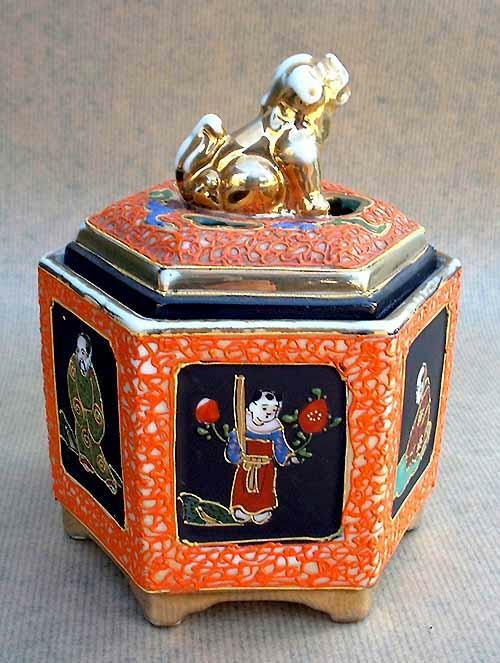 Sumptuous colors and extreme smoothness in the decoration. Height: 15cm. 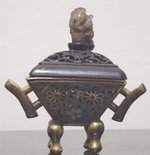 Length and width: 11cm. 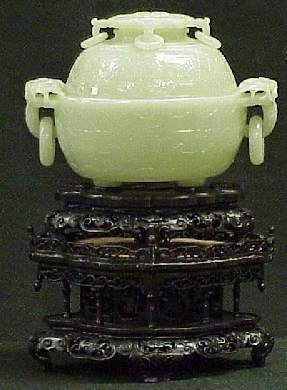 Width of a face: 5,5cm. 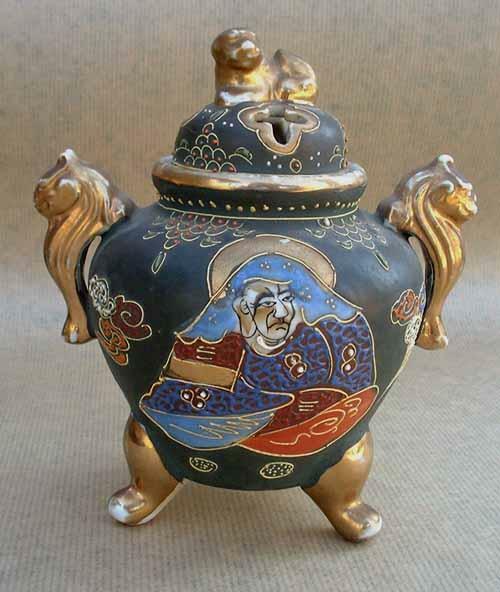 Description: Old incense burner in satsuma, with hand painted human characters, enamelled and gilded with fine gold. 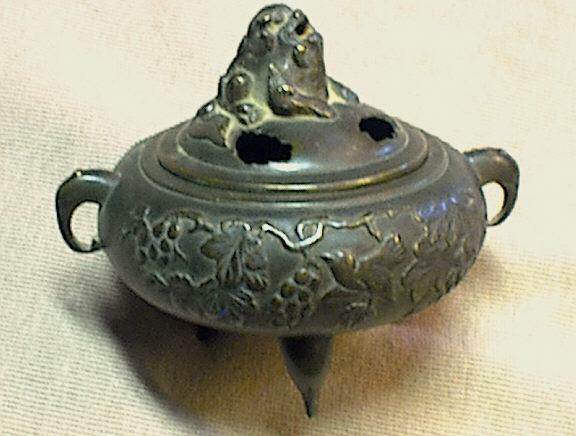 The incense burner is on three feet, The two handles are decorated with a dog's head and its openwork lid has a dog on the top. 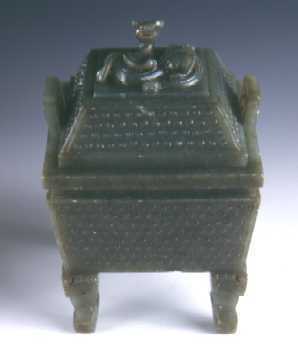 Stamp in lower part. Sumptuous colors and extreme smoothness in the decoration. 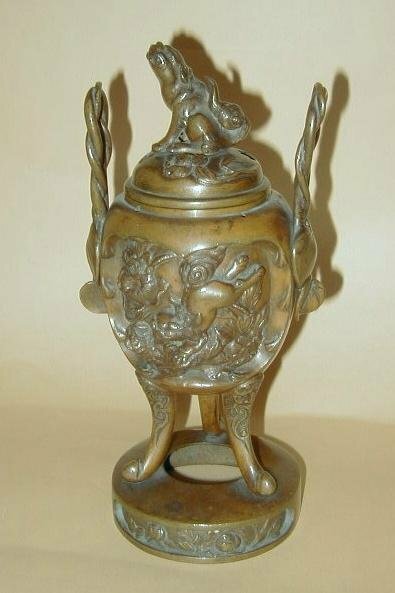 Height: 15cm. Length: 13cm. 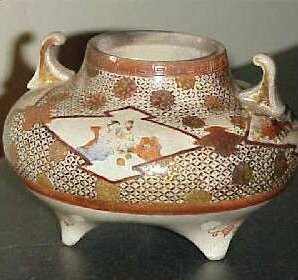 Width: 11cm. Description: An 19th century or earlier carved soapstone incense burner. Done in a soft green jade like soapstone. 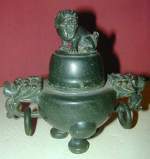 Description: This cloisonné incense burner stands 18 inches high with lion handled top. 24 in tall by 18 in. 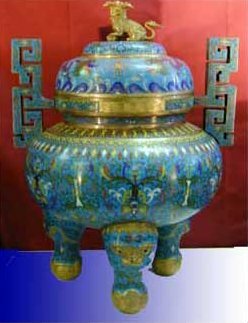 Cloisonné is a process of applying enamel to a metal infrastructure. The intricate patterns seen with cloisonné are achieved by corralling the different enamel applications between strands of fine wire (cloison) on the surface of a typically copper vessel.